Born on 1 November 1892 in St. Johann, Saarbrücken, Rheinland province. His parents are Stephan Steinlein and Catharina Rehn. They lived in the Grünstrasse 4 in St. Johann. Father Stephan was assistant stoker with the railway company. From August 1914 Jacob is Tsingtao soldier in the 2nd company of the 3nd sea battalion. He becomes prisoner of war in the Bando camp and possibly other camps in Japan. Prisoner number 2069. He indicates Saarbrueke 3 as his home address in Germany. Upon his release, he opts for a new life in the Netherlands East Indies. 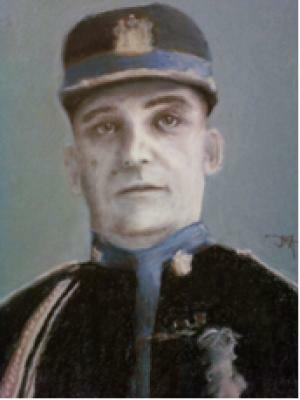 In 1922 he is assigned as main police officer in Kudus (Java). In 1935 he is posted as police inspector in Semarang (Java). He lives in the Gemelaan (?) nr. 16. In 1940 he is re-posted in Madiun (Java) where he is arrested. On 14 April 2011, Jaclyn (graphic designer, Hampton Roads, VA, USA, then in her early twenties) reports on her discovery that Jacob Steinlein is the father of her grandfather. Fascinated by this family history, she delves deeper in historical records and publishes the findings on her website: http://neutralocean.blogspot.com.es/2009/11/van-imhoff-portrait-for-my-opa-and-oma.html. “...Two weekends ago was my Opa & Oma's 55th anniversary. The family threw them a really nice surprise party. It's always fun to have the whole (well, most of them) family together, and it seems like that doesn't happen often anymore. When all of us "kids" were young it seems like we were all together all the time. For their anniversary present I painted a portrait of my Opa's father, Jacob Steinlein:. I think this was the hardest project I've ever worked on, because I really wanted it to be right. I researched about uniforms and this is what I came up with, since I was working with a black and white photo. What was also difficult for me were the emotions that staring at the old photo brought up, because there's always a story. Jacob Steinlein was German, but a Dutch citizen. Well, during WWII the Dutch imprisoned all of the Germans and shipped them from the location. Jacob was on the Van Imhoff. I've researched this a lot, because it was kind of a big cover up, since the Van Imhoff was bombed and sunk, and somehow everyone on the ship survived except for the majority of German prisoners, including my great grandfather. When I was painting this portrait I couldn't help but think about his horrible death..."
Jaclyn's site is well-worth exploring, including the responses on the forum page, where several descendants of Van Imhoff victims post their messages.